Have you ever wondered what it would be like to have your own island in the middle of paradise? 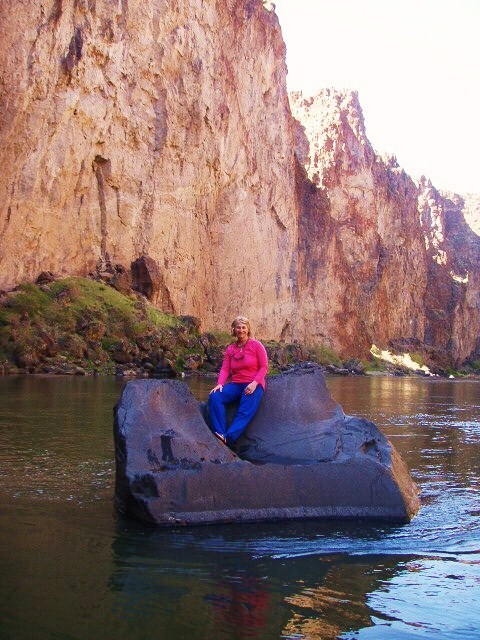 Well, this lady found her piece of the rock, or should I say, the entire rock, and was stranded on it in the middle of the Owyhee River. Terri had a few moments to be Queen of her own little island in the center of nowhere, or everywhere, depending on your view of the universe. Not only once, but on several occasions she had the opportunity to be in command of her own rock island. Although, one such island was a bit of a balancing act. Terri and I just came off a most enjoyable trip on this charming desert river. 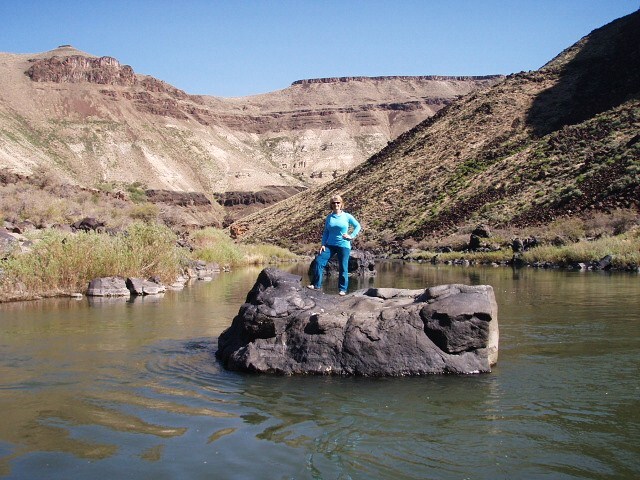 Another rafting couple was supposed to travel with us down the Owyhee River, on our original itinerary, but cancelled out at the last-minute, when the water dropped to levels they were not comfortable navigating. Not many oufitters will run a commercial river trip for just one person, due to the marginal economics of it all, especially when water conditions fall below 800 cfs, which is very challenging and demanding. Mistakes on the oars during low water can come with huge consequences and the margin of error is disastrously slim. However, I am one such outfitter willing to run such trips. Why? Simple. The Owyhee River is one of my favorite places, and any chance I have to see and learn more about this remote watery ribbon of desert river, is one I am quick to take advantage of. Also, with over a hundred trips down this canyon, in a high range of extremes (high and low water), my comfort level for taking on the harder navigational challenges is not as intimidating as it may be to others not knowing the area quite as well. So, I am willing to take on the hardships low flows present, because it enables me to get another trip on one of my favorite rivers of all time. Even with an extensive experience of many trips in this area, it still is an opportunity to discover more. It would seem that the more you learn, the fuller you would get. But, just the opposite is true. The more you learn, the more you appreciate how much you don’t know. Thus, revelation of nature’s mystery is everywhere, all around, all the time. A curious mind is the only thing necessary to enjoy the magic. I always find something new on every trip. 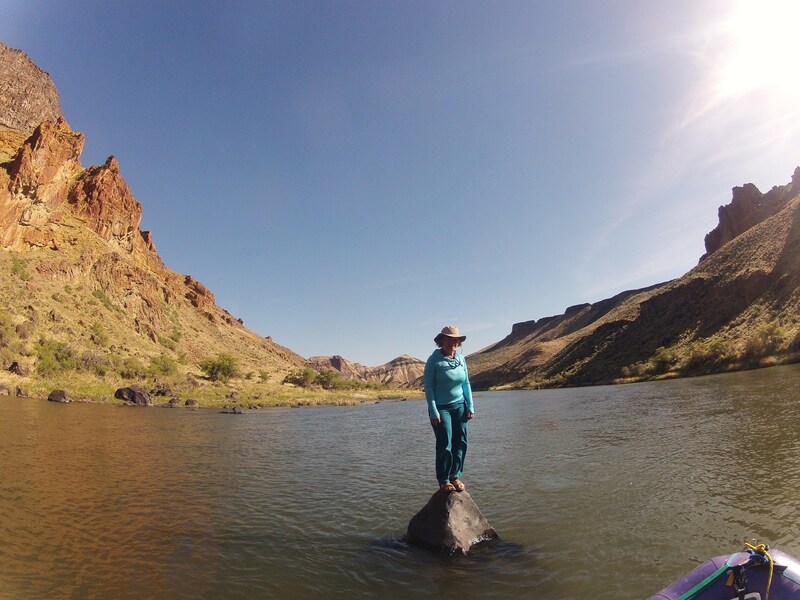 Since this was Terri’s first trip on the Owyhee, everything was new. Each bend held another threshold of beauty, just waiting to be passed through. In anthropomorphic terms, the canyon walls could be seen as taking pride in having its outstanding natural charm appreciated by mere human forms. While some women use several tricks with make-up to high light their personal beauty, the canyon just waits for special lighting conditions. Indeed, the effect is most astounding. The remoteness of the Owyhee can create feelings that are hard to describe. It is akin to what it would be like if you were ever marooned on an island in the middle of the ocean. We did not see one other float party during our entire four-day trip. This alone, adds another dimension to that remoteness and feeling of isolation created. Wonderful, is all I can think to say. Peace. Blissful appreciation for nature, also come to mind. No distractions. Distilled nature at her finest. In this day and age of so many people on the planet, and so much alterations of nature by man’s hand, it is an exceptional treat to actually know there are still places that remain where you can escape, find temporary refuge, and still appreciate un-marred naturalness of our orb in the cosmos. The Owyhee River is one of those places. I love magic. It was a great trip and I enjoyed myself immensely. Gary was an outstanding host. I had one of the best, most relaxing times of my life. I learned so much about this area, but I know that there’s a lot more to explore and discover. And because the water was so low, we found some hot water flowing from rocks that are normally under water. I’m saving my pennies to go again next year. Thank you for the gracious comments. In reality, guest like you who are so very easy to get along with make my job far more easier and enjoyable. Like I tell most folks who ask if I get tired of the grouches and sour-pus types…well, unlike doctors and lawyers whom deal with peoples problems and ills, I see people when they want to be having fun. Even a-holes want to have fun. By the way, you bet, Owyhee again next year, sounds good to me, but hey – not sure we can find you a smaller island to stand on and call your own?? ?